Russian technology and developments in the field of electronic warfare are among the most advanced in the world and hidden from the public gaze. Modern military conflicts involve less and less contact fighting. The wars gradually shift into virtual reality, and opponents often compete not in firepower weapons, but in the effective use of radio electronic warfare that can easily deceive the enemy, blind his radars or guide the fired missiles onto the false targets. RIR decided to lift the veil of secrecy and selected five most effective Russian EW (electronic warfare) systems. This relatively small container in the shape of a torpedo is mounted on the wingtips of the aircraft and makes the sky machines invulnerable to all modern means of defence and enemy fighters. After the crew receives missile attack alert, Khibiny comes into action and covers the fighter with radio-electronic protective hood, which prevents the missile from reaching the target and makes it deviate from the course. Khibiny increases the survivability of the aircraft by 25-30 times. According to deputy general director of concern KRET (developer and manufacturer of this EW system) Vladimir Mikheev, all the fighters that Russia lost in Georgia were naked, ie. without the installed EW means, and this fact has caused the loss of the Russian military equipment. By the way, nowadays Khibiny is being installed on Su-30, Su-34 and Su-35, so the famous April attack in the Black sea on USS Donald Cook by Su-24 bomber jet allegedly using Khibiny complex is nothing but a newspaper hoax. The destroyer's buzzing did take place. This EW system can completely neutralise the enemy radar, but Khibiny are not installed on Su-24. 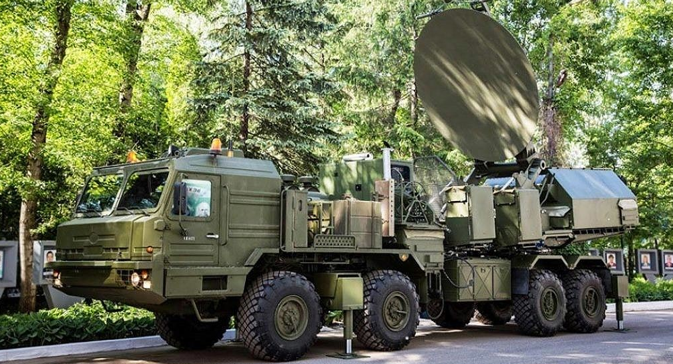 The modern radar complex, which Russian troops are about to receive, can see and accompany all airborne targets at a distance of 400 km (previous similar radar development Avtobaza could track objects at a maximum distance of only 150 km). Moskva-1 operates on the principle of passive radar. This means that it does not emit any signals, only receives and analyses the outer ones. Therefore, unlike conventional radars, it remains invisible to the enemy. Scanning the airspace, Moskva-1 determines the type of the object and is able to correctly classify it as a missile or an aircraft. The station immediately transmits this valuable information to the command post, and then the operator decides to destroy the object or not. In addition, Moskva-1 can guide air defence system to the target, so that it keeps its radar off, staying invisible to the enemy fire till last. Despite its funny frivolous name, this ground EW complex represents a real terror for AWACS (Airborne Warning and Control System) aircrafts. Krasukha’s main task is to protect and to plug the air defence, the ground facilities and to provide security of troops groupings on the march. PTRC Iskander and other similar complexes are quite defenceless on the march. Krasukha enables them to easily reach the given destination and deploy the combat crew. Once Krasukha notices the enemy AWACS, it affects its radar with an interfering radiation within a radius of 250 km. Such jamming radio-electronic suppresion makes precise weapon guidance impossible. Another feature of Krasukha is influencing the brain of the fired missiles and changing the flight task. As a result of Krasukha's intervention, the missile begins to see a false target and hits it without damaging the hardware. This EW system is one of the most advanced to date. Rtut' (Mercury) is designed to protect soldiers and equipment from artillery fire, in case the artillery is equipped with proximity fuses. In order to cause irreparable damage to manpower and weapons, proximity fuse must explode at the height of 3-5 meters. Rtut' affects proximity-fused ammunition making it explode at a safe height, which keeps the troops intact. It's not only proximity fuses that Rtut'-BM complex is able to counteract. If necessary, it can be used to kill frequencies at which the enemy is radio-communicating. One complex (similar to an armoured vehicle with a television antenna) is able to protect an area of 50 hectares. According to the developers, Rtut'-BM has a great export potential and can be supplied to the traditional markets of Asia, Middle East, Africa and Latin America. President-S is a complex of optical-electronic suppression, which can protect from destruction any aircraft that is being attacked by missiles fired from MANPADS, equipped with heat seekers (elements that react to heat produced by the running engine of an aircraft or helicopter). During test firing, the missiles were fired from Igla (Needle) at a Mi-8 helicopter, fixed up on a special rig. Missiles were fired from a distance of 1000 meters, and not a single one reached the target - all the missiles deviated away from the helicopter and disbanded: missile guidance system was simply missing the target due to electronic interference created by the complex.